Events and conferences are a great time to network, showcase your product/service and learn from the best in the industry. However, choosing the best marketing events to attend can get a bit tricky. From the line-up of keynote speakers to the panel discussions held, there are a number of factors you need to consider before you head out to one. 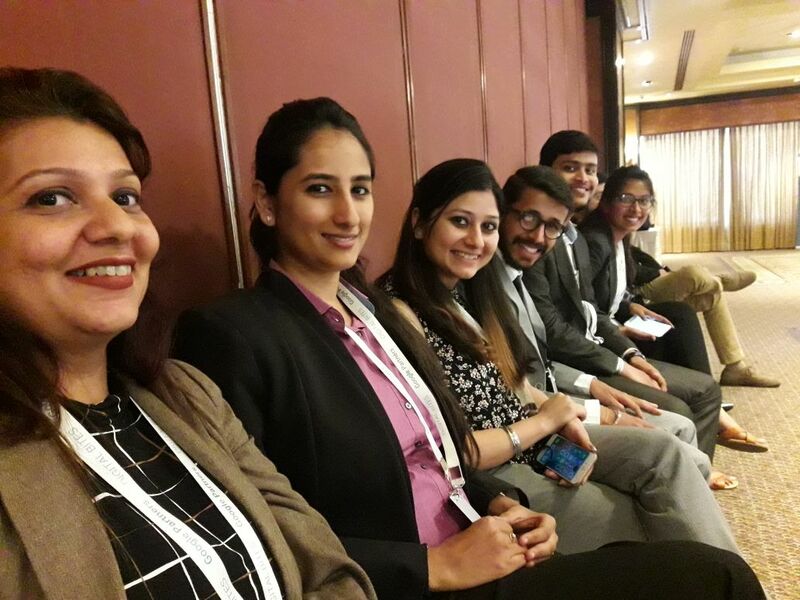 Read on for our hand-picked compilation of the top digital marketing events in Bangalore that you need to attend to enlighten your team and grow your business. BEEGITAL’s digital and social media marketing summit is every digital marketer’s paradise, packed with the latest digital marketing tools, strategies and cutting-edge techniques. It is a one-day event that throws light on the use of social media to catapult your brand’s digital presence. Sign up for a day full of insightful sessions on Artificial Intelligence, Chatbots and Big Data Analytics presented by industry experts. 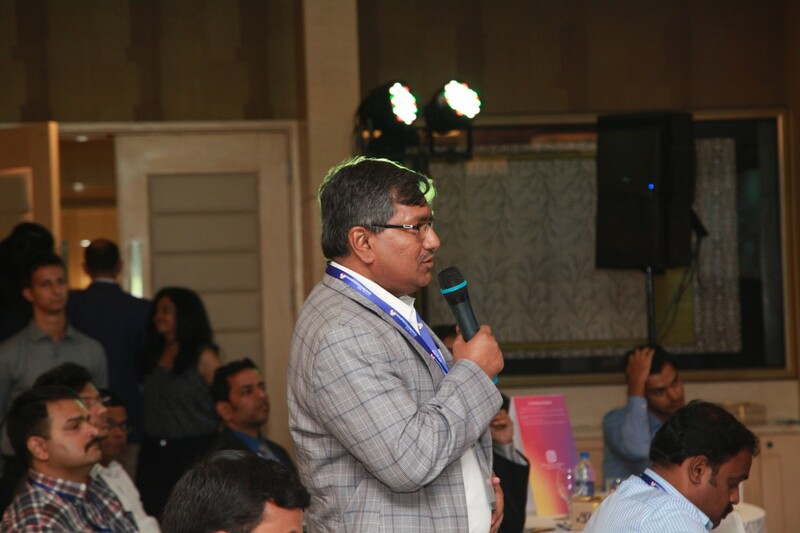 Digital Leadership Summit in Mumbai, Bengaluru & Chennai is a CXO event which brings together Business Leaders and CMOs to discuss how to drive business results through digital marketing and share innovation across Video, Vernacular Content, Voice, Artificial Intelligence and Virtual Reality. The business leaders and attendees would be from across sectors, including FMCG, BFSI, Real Estate, Entertainment, Education and Internet Businesses. 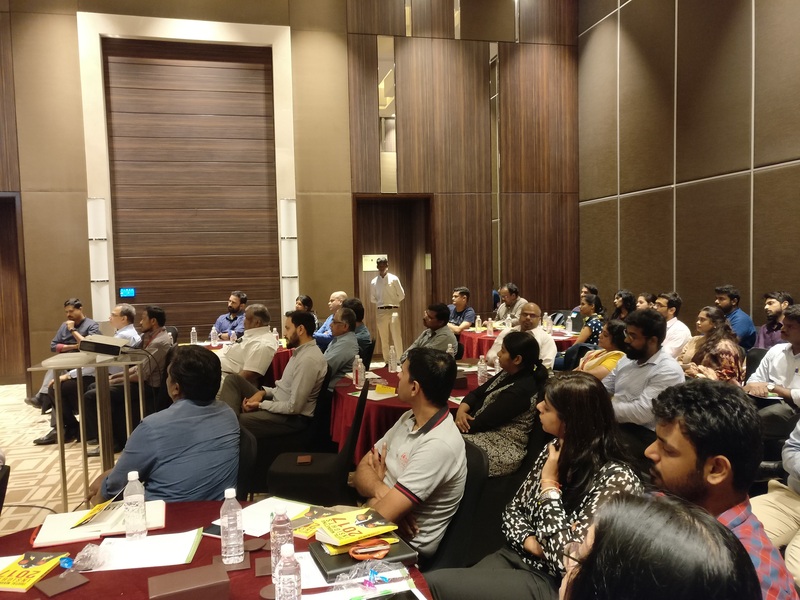 The last Digital Leadership Summit is in Bengaluru was in February 2019. The one prior to this was on 15th Nov 2018 in Mumbai. The first edition of the Digital Leadership Summit was held in Chennai in 2016. Brand Summit & Hot Brands is a regular event by Paul Writer and they do this across Bengaluru, Mumbai & Delhi. Paul Writer is known for its marketing through research, peer learning, and sharing best practices. The Brand Summit is conceptualized as a power-packed day of masterclasses, discussions, sharing, and learning along with celebrating the achievements of the Hottest Brands in the respective cities. The impressive line-up of jury members includes industry experts and marketing professionals from various renowned organizations of the nation. The keynote speakers include Ravi Desai – Director of Mass and Brand Marketing – Amazon India, Burhanuddin Pithawala – VP Growth and Conversions – OYO and Vivek Sunder – Chief Operating Officer – Swiggy, to name a few. When: 8th February 2019. 8:30 am to 6:00 pm. Join the industry thought leaders as they come together to discuss the digital transformation of the innovative business world at the 5th Inflection Digital Transformation Summit and Awards. Hosted by the Alden Global Value Advisors, the summit is packed with an impressive line-up of panel discussions, forums, insightful keynotes and unmatched networking with the best of the best from the industry. The event also includes an award ceremony where industry leaders are identified for innovation and excellence in logistics, procurement and supply chain. When: 23rd January 2019. 9:00 am to 6:00 pm. What better way to celebrate the growth and transformation of the digital hemisphere than by conducting an online digital marketing event? DigiMarCon India 2019 is a larger-than-life online conference and exhibition scheduled to be hosted online – live and on demand. It will be the online hub of leading digital marketing professionals with sessions on a multitude of topics including digital strategy, content marketing, customer engagement, email marketing, programmatic advertising geo-targeting, growth hacking and all things digital. Learn all you need to know about digital marketing with keynotes, bold talks and big ideas presented by industry leaders from across the globe. Where: Online – Live and On Demand. When: 4th and 5th September 2019. With seven keynote speakers covering seven powerful marketing topics that are the need of the hour today, 121 Digital Marketing Summit is a one-stop destination to learn all about digital strategies and branding. From the growth of influencer marketing and how digital marketing in India will change in 2020 to innovative ways to measure the impact of your branding campaign, it covers it all. Attend the session to learn what strategy works best for your business today and the digital approach you need to take up to stay on top. When: 31st January 2019. 8:45 am to 6:00 pm. Whether you are a leading real estate giant, a top FMCG brand or a well-established financial organisation, make sure you attend these insightful events to keep up with the fast-evolving digital landscape. You can also check out Digital Bytes - our YouTube channel on the latest digital marketing trends in the industry. The second edition of our Digital Leadership Summit was a grand success with key insights shared by industry leaders from across India. Among the interesting topics discussed, one of the panel discussions was on ROI through digital marketing videos. The panel was moderated by Vikas Chawla and our panellists included Pradeep Nidamarthi of Reliance Capital, Monish Ghatalia of Focus Communications and Prashin Jhobalia from the House of Hiranandani. They discussed the industry-wide approach to digital marketing. Focus on the number of leads and not just the number of impressions. Although everything about marketing will change in the next five years, the way a customer thinks will not. Use that to leverage your business’ position in the market. How has digital marketing impacted your business? According to Pradeep Nidamarthi of Reliance Capital, the impact of digital marketing can vary from each organisation as they have a different outlook on its success. Some people in the organisation view it as a long-term strategy where the payoff occurs over time while others have a short-term view and look at digital marketing as something that should bring them value on a quarterly basis. He says that the success metrics depend on the discovery, conversion and repurchase components of the main cycle. The impact of discovery on digital marketing is often hard to measure, so companies usually look at their engagement and conversion rates as the major success metrics. Monish Ghatalia of Focus Communications said that one of the key metrics of the business is to understand the digital behaviour of the person. That is how they behave when they watch a commercial on TV vs when they watch an advert on Youtube. As customer behaviour changes, the mindset of the company has to change as well. Additionally, this shift from traditional to digital marketing can also affect various sectors of the business as they start thinking digitally. Statistics show that 5-10 per cent to 15-20 per cent of a business' marketing budget is used towards digital marketing when acquiring a new client. “For the real estate industry, many companies are not as marketing savvy as they would like to be,” said Prashin Jhobalia of the House of Hiranandani. “This is because they find it a challenge to segregate their customers into different buckets.” However, the impact of digital marketing in the business is its ability to put up numbers as proof. This helps them understand what the money is put towards to justify spends and measure return on investment. How has attribution changed the business? Real estate needs depend on the need of the client and the stage of life they are currently in. Jhobalia believes that a business is able to market its brand to the company if they are able to identify this individual and reach out to them at the appropriate time. “The customer journey is different for each business,” said Nidamarthi. For example, with Reliance Capital’s general insurance policy, if a person has decided that they want to buy insurance, they have already done the research on the different policies available before approaching Reliance. At this stage of purchase, there is not much the company can do to change the customer’s mind other than the price. Therefore, digital marketing does not have an impact if the customer is already aware of the product. But for products like mutual funds, digital marketing has an impact as the discovery process is longer. He adds that brands should not just spend money on impressions but should also give importance to the visits that lead to your digital property and the interaction with the customer. What is the secret sauce of digital marketing? Monish Ghatalia says that the fundamentals of marketing believe that more is more (that is, more budgets, more people). However, with digital marketing, the mindset has shifted to less is more. Digital allows us to build the core customer base and because we live in a sharing economy, we can convert this customer base as well. He believes that if 100 core customers are acquired and nurtured, they can lead a business to its next 1000 customers. Therefore, the secret sauce for the business is in its approach to acquiring clients and adopting the framework of the current digital marketing industry. Additionally, businesses should aim to move their customers from conversion to brand loyalty. Instead of spending 99% of the budget on lead conversion, they should spend only a particular amount of the budget to go beyond just conversion and encourage customers to become loyal to the brand. In the real estate industry, Jhobalia says that the secret sauce lies with the marketer and there is no single solution to success. The business needs to understand its objectives and use relevant information to remarket the brand to the customers. All businesses have a digital marketing funnel and it is the duty of the companies to either drive people through the funnel or improve conversion through the funnel. Take a look at our in-depth video on full-funnel marketing here for more information. Collect and collate your data from all the sources available. This can help you build the user journey from discovery to repurchase. Once you have collected all the data, you should have a master view of all the channels used by the business. That is the channel used to promote a good or service and the frequency at which the ad is shown. The CRM process needs to be streamlined and constantly updated. You need to have employees who are native to the digital world. They should have a good understanding of how digital marketing impacts the customer journey. Having a good understanding of all these four components can help a business master their business digital marketing strategy. Reliance Capital has numerous lines of businesses and each of them is in different stages of digital marketing with different regulators across the board. The biggest challenge for the companies over the next three to four years is that the common man will become more aware of privacy and will interpret it differently. When it comes to the use of data and systems, companies need to be more careful about how they use customer’s personal data and err on the side of caution. According to Ghatalia, the biggest challenge faced by businesses is their ability to converge traditional marketing, digital marketing, technology, Artificial Intelligence and data. Companies need to understand that although these components will change in the next four to five years, the way a customer thinks will not. As a future marketer, they need to leverage this idea and be able to marry vehicle one (digital) to anything else in the digital market. In the real estate industry, Prashin Jhobalia says that the ability of companies to recreate traditional content for digital media is a challenge. Another problem is the overpopulation of ads that creates competition within the industry. The developer might create an ad to target their customers while the distributors and brokers create different ads to target the same customers, this self-inflicted competition can create a lot of confusion in the industry. In order to overcome this challenge, businesses need to understand and react to the customer’s changing needs in a timely and efficient manner. One way of doing so is making use of vernacular ads. The panel ended with a discussion with the audience, the panellists provided numerous thought-provoking ideas on the the future of digital marketing and improving ROI. The second edition of our Digital Leadership Summit was a grand success with key insights shared by industry leaders from across the nation. 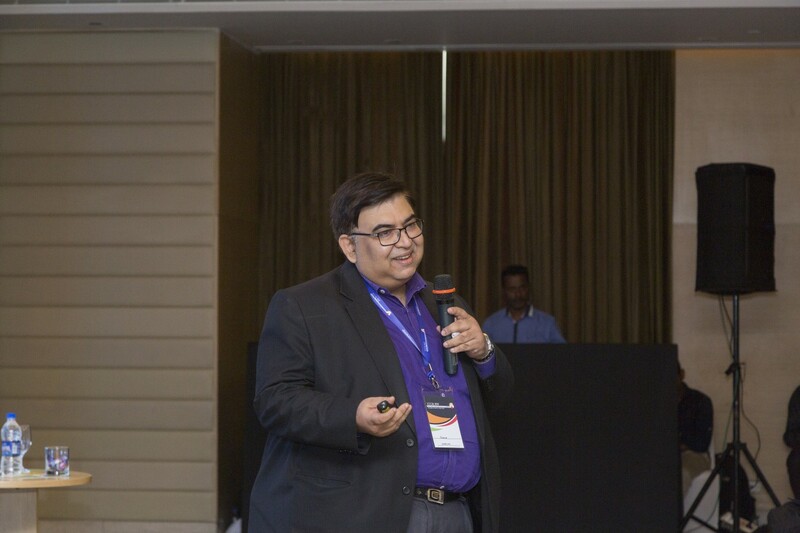 Mr Omkar Rajadhyaksha – Managed Partners Lead, New Business at Google – was our first speaker who threw light on the strategic methods brands can take up to grow their business through Google in 2019 with focus on futuristic digital marketing trends to look forward to. Let’s take a look at the key insights of the session. A mobile-first approach is the way to go to reach consumers effectively. Videos are the future with a 400% increase in consumption through mobile on YouTube. Multilingual marketing is the need of the hour with 88% of users preferring vernacular over English. Voice assistants have transformed the way consumers are searching for content online. Brands need to anticipate the intent-rich moments in a consumer’s journey to push them to conversion. Online-offline integration is key to capture the entire 360° of a consumer’s journey. How has the digital ecosystem evolved? With 650 million active Internet users in the nation, almost half our population is consuming content online. However, 7 out of every 10 Indians access the Internet through mobile, entirely surpassing the desktop and creating a mobile-first ecosystem for brands to leverage. To add to this, the introduction of Jio has led to a five times increase in 4G data being consumed, when compared to the 2G and 3G plans used before. This has contributed majorly to the online growth of brands. Though the nation is still lagging behind in terms of speed, the easy access to inexpensive data plans, coupled with the drop in the prices of smartphones, is a good start. After Google, YouTube is the second most-used search engine proving that videos are the future. This platform alone has witnessed a 400% increase in video consumption through mobile alone. These staggering numbers only prove that organisations should leverage the reach of videos to tell their brand story. The most-searched genre is that of entertainment with the top searches being comedy clips and song covers. The other genres that are very popular are food-related content, how-to series and mobile unboxing videos that have also contributed majorly to the expansion of YouTube. The growth of regional content has been one of the biggest digital marketing trends in the past few years and is showing no signs of fading away. As per a recent Indian Readership Survey (IRS), each one of the top twenty publications read across the nation is in a regional language except for Times of India that ranked in the eleventh position. Furthermore, there is no surprise that the same behaviour is being translated online. As per a recent survey conducted by KMPG, a whopping 88 percent of online users said they would click on a multilingual ad rather than one that is in English. Consumers are adopting innovative ways to search and shop, and voice assistants are playing a huge role in this aspect. As per a recent survey conducted by Google, 28% of queries are made by voice on search apps. Furthermore, there has been a 400 percent increase in Hindi voice searches ever since Hindi was introduced as a language on the assistant. There has also been a 63% increase in phone-unboxing searches, especially when the phone is bought online, with a 70% increase in price-related searches for smartphones falling in the range of Rs 5,000 to Rs 15,000. With digital and mobile merging together as one, the whole formula for brands to drive growth has evolved. Google closely observed the online behaviour of 100,000 active users and noticed that the marketing funnel is no longer just about awareness, consideration and purchase. It is filled with intent-rich moments of consumers when they make direct queries online, redefining the traditional funnel-like approach. The new-and-improved marketing funnel is now not as streamlined and has the potential of adopting an hourglass, diamond or a pyramid shape based on the intent-rich moments of consumers. These moments of intent, also known as micro-moments, play a huge role in either expanding or narrowing down the consideration set of the funnel. This proves that a consumer’s online journey is unpredictable and brands need to anticipate these micro-moments to target a custom intent audience. So where does Google fit in all this? The world’s largest search engine has seven different products to offer based on utility. From Google Maps and Google Chrome to Gmail, these digital utilities are free and help in the day-to-day digital routines of consumers. They are updated regularly through machine learning and artificial intelligence to adapt to the lifestyle of the users. Furthermore, these products can be monetised to ensure your brand is present across the intent-rich moments of your consumers. TrueView for action form ads: YouTube has come a long way from a mere video platform to the cusp of performance and branding. Organisations can now drive performance through YouTube with TrueView for Action form ads that present the user with a pre-filled form along with the ad. This is a classic example of how brands can reach out to viewers during an intent-rich moment. YouTube home feed ads: Just like masthead ads, YouTube home feed ads are plastered on top of the YouTube home feed every day, targeted based on the content consumption pattern of the user. These ads have the potential to create a billion impressions with 100 million unique ones pan India per day. They are all the more enriching since they are in video formats and are far more effective than search and display ads that are almost static today. Display ads in Discover: Formerly known as Google feed ads, these ads are designed to look and feel native to organic cards for seamless brand placement on Google feeds. However, it is important to focus on the creative and the messaging of the ad and not go in for plain Jane designs. A lot of digital-first brands are looking at brick and motor. Since the consumer journey has now altered the traditional marketing funnel with more research going into the consideration stage, online brands are adapting to this change with pop-ups and stalls to showcase their products. Even if consumers are completely convinced to buy your product online, they prefer visiting the physical store to experience the look and feel before investing. This proves that it is a merit to integrate your online store with offline sales to capture the entire 360° of the consumer journey. Users get influenced online and experience the product offline making it a win-win for both brands and consumers. Whichever sector your firm belongs to, marketers should hold their digital media accountable for business. Instead of basic digital metrics like the number of clicks and the CTR, you should also tie up your media spend to revenue, profit margin, gross margin and other business metrics. It is time we stop considering the average value of metrics to measure digital performance. Instead, brands need to identify the consumers who spend more on online products and let go of the ones who are left over by your competitors. It is essential to look for profitable consumers who will build your business. As the saying goes - the only thing that is constant is change! Google’s digital utilities work on automation to learn from the changes and provide higher ROI. It is safe to say that in today’s digital age, automation is the way to go. If not, your brand will definitely be left behind by its competitors! The insightful session by Mr Omkar Rajadhyaksha was an eye-opener for leading brands and marketers. Whether you are a top real estate developer, financial giant, FMCG brand or a B2B organisation, make sure you adapt to the evolving digital ecosystem and grow your business. 16th November 2018, Mumbai - We at Social Beat organised the second edition of our Digital Leadership Summit - a convergence of several business leaders across industries. 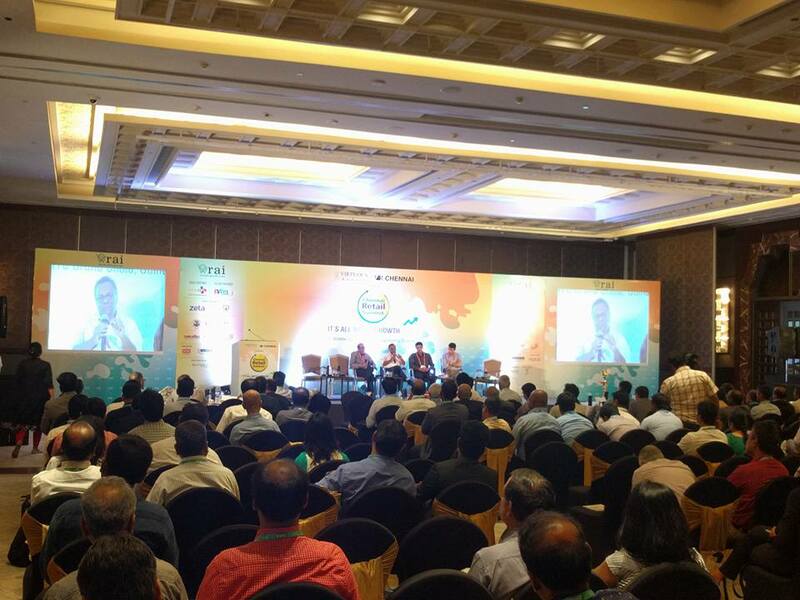 The first edition took place at Chennai with a focus on driving ROI from digital marketing. One of the biggest talking points of the Summit this year was innovation through Voice, Video and Vernacular with CMOs from various sectors sharing their insights and experiences. The keynote speaker, Mr Omkar Rajadyaksha from Google, kick-started the event on what businesses can scale up with Google in 2019. The Summit also focused on driving business results through digital marketing with marketers and brands voicing out common challenges they face and upcoming trends. While there are around 450 million internet users in India currently, this number is set to hit 650 million by 2021. These numbers prove even more significant as the vast majority of new internet users will come from Tier II and Tier III cities. The summit highlighted the importance of tapping into India’s next billion internet users by harnessing the power of Voice, Vernacular and Video for an effective digital marketing strategy. David Appasamy, Head – Brand and Strategy moderated another panel discussion on AI, Augmented Reality and Vernacular in the future of Digital Marketing. Appasamy opined, “Digital platforms have, over the last decade, redefined the way we communicate, build our businesses or entertain ourselves at anytime, anywhere. Now artificial intelligence and augmented reality are taking it to a whole new level in terms of efficiency and experience while vernacular is opening up the platforms to native language speakers and new markets.” Appasamy was joined by Channan Sawhney, Head of Digital Marketing at Johnson & Johnson and Pratyush Kukreja, Head – Product Monetisation at Haptic. The Summit also had a session on how brands can grow and innovate through digital by Mr Abraham Alapatt, Group President and Head – Marketing, Service Quality and Innovation at Thomas Cook. The Summit concluded with an interactive workshop where attendees were asked to draft their digital strategy guided by the digital experts at Social Beat. A number of members of the press and digital news publications were among the attendees and the Summit received a lot of coverage, from afaqs! in particular. The number of people online today in India is greater than it ever was before. Currently, there are around 450 million internet users in the country and this number is likely to increase to 650 million by 2021. But what is more significant than just these numbers is that a majority of these Internet users will be coming, not from the big metros, but from the smaller towns and villages of India. Along with a shift in audiences, there has also been a change in the way audiences access the Internet and what they do on it. In the first edition of our Digital Leadership Summit, we discussed how measuring ROI is one of the biggest challenges for digital and content marketing. For a brand to capture the next billion Internet users in India, finding a way to adapt to the new market is essential – which is exactly what we will be addressed at the 2nd edition of the Digital Leadership Summit by Social Beat. In this edition, marketers and brands can get a closer look at the biggest challenges and upcoming trends in the digital space from the reigning experts in the field. As a sneak-peek, let’s take a look at the three factors that have emerged as indispensable in a brand’s digital marketing strategy: video, voice and vernacular. In 2016, Nicola Mendelsohn, VP of Facebook’s operations in Europe, Middle East and Africa predicted that in 5 years, Facebook’s newsfeed would comprise of videos alone. At the time, this claim sounded far-fetched. However, going by recent trends, video content will soon become the most important type of content created for the Internet. Each day, around 100 million hours of video content are consumed on Facebook alone. When Indians aren’t watching videos on Facebook, they’re watching them on YouTube. As per YouTube Brandcast 2018, the world’s second largest search engine currently has around 225 million active monthly users in India, with this number set to increase to 500 million by 2020. A majority of these users watch videos to help make purchase decisions. Clearly, the fastest way for brands to capture the attention of their target audience will be to make engaging, easily understandable videos to tell brand stories. Check out our case study on how Cholamandalam Finance harnessed the power of videos and vernacular content to widen their reach. At the Google for India summit in 2017, the growing importance of voice search in India became even more evident. The Google year in search report also mentions, around 28 percent of all Google searches in India are through voice. Even more significant was the fact that a majority of these voice searches were conducted in vernacular languages. Hindi voice queries are growing by around 400 percent year on year. India is also witnessing the increased usage of personal assistants such as Siri, Alexa and Google Home. The advent of voice search points towards a fundamental re-thinking of tried and tested SEO strategies. Since voice search results only pick up the most relevant result (usually the featured snippet), digital marketers will need to optimise their content to ensure it is voice-ready. Two of the biggest developments in India’s digital story in recent years have been the steep drop in smartphone prices and the availability of affordable high-speed internet, catalysed by the Jio network. Both of these factors have led to the growth of internet audiences from tier 2 and 3 cities and towns in India. For marketers, it is attracting these audiences and not the urban population that will prove crucial. A study found that around 70 percent of Indians trust regional content online more than English language content. If brands want to engage with the next billion internet users in India, the way forward is vernacular content. Currently, Tamil is the most used regional language online with 42 percent, while Hindi follows closely with 32 per cent. To tap into this huge potential, a strong, comprehensive strategy with end-to-end messaging in regional content is indispensable. Read our case study on how a multilingual approach generated 90% growth in leads for further insights. Apart from these indispensible marketing strategies, the session will also throw light on how artificial intelligence will change the way marketers work. The newer emerging trends around AI, chatbots and machine learning, have proved to be a game-changer in digital marketing, working wonders for brands across all sectors. Immersive experiences like virtual tours of an apartment even before a site visit have added much-needed value to the content being consumed by potential buyers. Automation and machine learning have also pushed smaller brands to adapt programmatic advertising. Does your marketing strategy tick the three V’s and marketing automation? 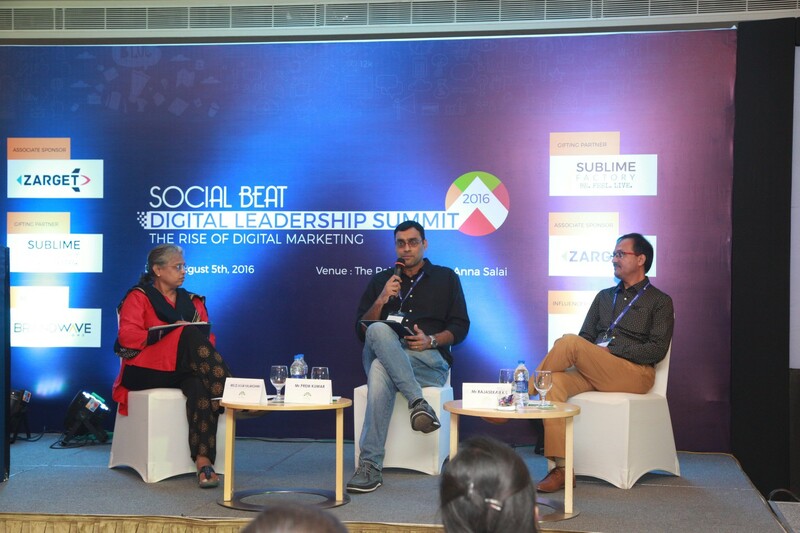 Find out how your brand can gear up for the future at the 2nd edition of the Digital Leadership Summit by Social Beat. 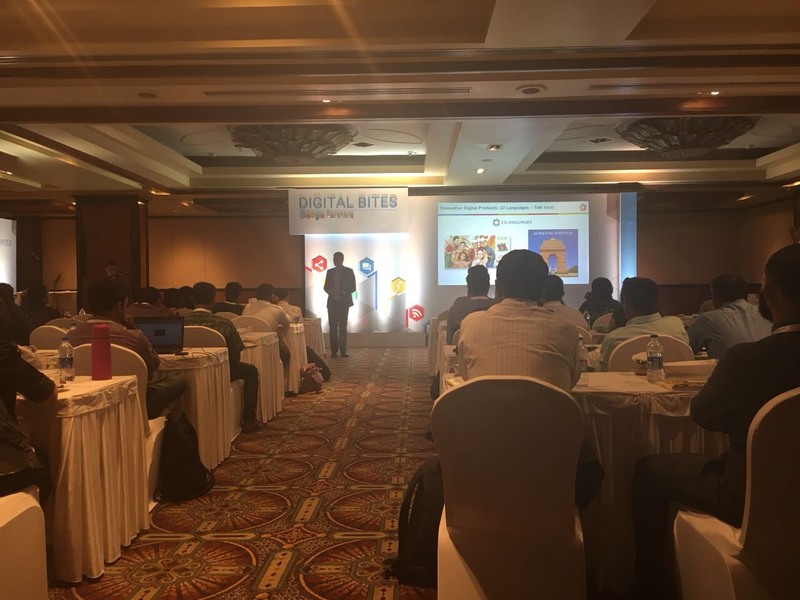 Our first Digital Leadership Summit covered the rise of digital marketing in India, but the digital landscape has changed drastically since then. Register now to get the latest industry insights from some of the biggest names in the field! 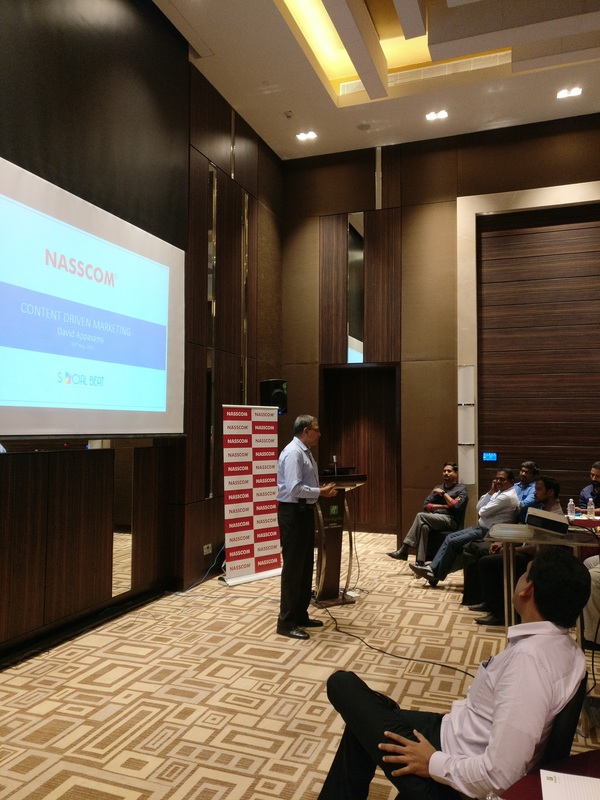 Social Beat was proud to be part of the NASSCOM Content Marketing Masterclass which took place at Holiday Inn, OMR, on the 16th of November, 2017. The session was led by David Appasamy, head of Branding and Strategy at Social Beat and provided insight on how content marketing can be effective for lead generation in the B2B sector. The session introduced the attendees to the strategic imperative of marketing and highlighted the importance of content marketing in the digital space. The insightful session threw light on how content marketing builds credibility, confidence, and preference by establishing thought leadership and helps win attention, engage with and convert prospects into customers. It also focused on the ways in which this marketing strategy enhances and amplifies other marketing initiatives such as Social Media Marketing, digital advertising, and lead generation. The Advertising Week 2017, held in the fast-paced city of New York, was as insightful event throwing light on the relevant, upcoming trends in the advertising and marketing world. Held during the last week of September, the conference had a series of seminars, discussions and workshops hosted by the pioneers in marketing and advertising from around the globe. Read on to get a closer insight into the keynotes we took back home from the eventful week and how they can be utilized to build a successful brand. Howard Schulz of Starbucks, Jessica Alba of Honest Company, Neil from Warby Parker and more - there were so many amazing brand creators who shared their insights on how they conceptualized the brand and how they built it step by step into successful brands. These inspiring stories do instil confidence on how amazing product combined with honest and creative advertising can build brands. One of the central themes that were discussed at the Ad Week was how creativity is enhanced with the power of data and analytics. Using consumer behaviour data and analytics from advertising campaigns it’s possible to create more powerful brand campaigns. For example, Dominoes presented how they listened to their consumers and realized that many of them were not happy with the way the pizza was reaching them because there was a huge discrepancy on how pizza brand videos were made and how it actually looked. So Dominoes did a series of video which shows how food photography and food videography can be deceptive. Then decided to crowdsource images from customers to see how they received their pizzas and about 25,000 customers submitted their pizzas to “Show Us Your Pizza”. While most of them were happy with their pizzas, some weren't. So their CEO apologised to the customers and started implementing internal processes to avoid it again. Moreover, they gave a refund a free pizza to unsatisfied customers. Their honesty in advertising combined with the creative campaign helped them tremendously with growth in market share in the USA. ChatBots have already begun creating a rage in the digital marketing space and Advertising Week 2017 left no stone unturned in letting us know that. The Facebook Messenger Bot leads the bot universe with advanced customer service that helps consumers reach the solution faster. This, in turn, helps in an enhanced lead generation. Furthermore, experts have also noticed an emerging trend of voice-based devices entering the digital market. It is said that interacting with a bot is sometimes more effective than visiting a mobile site as it provides more customised and personalised engagement. For example, the bot designed by KLM Airlines can address numerous queries from travel information to a flight change. This makes the entire digital experience of the consumer more convenient and hassle-free. However, it is advisable to use existing apps, like the Facebook Messenger, to reach your target group instead of building native apps. With Google Home, Alexa and others launching intelligent assistants it’s become an exciting space to watch out from an advertising perspective. With 40% of searches in the USA being voice searches, it is likely to change the fundamental business model of Google. While assistants still have slow adoption in India it’s a space to watch out for. With users accessing websites, apps and content from multiple devices and some devices with no screens (i.e. assistants like Google Home), attribution is getting harder. The initial days of Advertising Week 2017 introduced us to the concept of split funnel advertising to help measure attribution for enhanced sales and lead generation. The model helped us understand consumer behaviour and figure out which touch points of the consumer need attribution. To begin with, the seminars held on smart attribution made us familiar to the fact that most funnel models highlight which channel is the most useful to increase conversions but do not explain why the consumer converted in the first place. It also helped us understand that consumer behaviour is critical to attribution and the only way we can understand consumers is by adding a twist of creativity to the marketing funnel. Additionally, the workshop focused on how the marketing funnel model can be made even more efficient by gathering data from different fields and adding in multiple channels that generate guaranteed results. To achieve this, it is important to figure out which channel generates long-term revenue. Channels that add a lifetime value to the marketing funnel have the potential to change the attribution piece completely, especially when complex channels like that of TV and other non-digital aspects are involved. We just started testing it out and will share more insights shortly. Digital out-of-home taps the concept of traditional advertising by adding a digital twist to it. It utilizes the conventional channel of outdoor banners, billboards and digital screens in public spaces to showcase a product to consumers. Since people are noted to be outside their homes 70% of the time, this mode of advertising helps in a more integrated targeting. Viewers are not interrupted by digital ads on their personal screens but on the screens, they are exposed to on a daily basis. Additionally, digital out-of-home ads cannot be fast-forwarded, skipped or blocked, giving brands the added edge of reaching out to their audience. Apart from merely detecting the GPS location and retargeting consumers, these ads can also be triggered by other factors, like weather conditions, to showcase a refreshing product on the screens during a hot sunny day. Furthermore, digital out-of-home ads can also be customized for security cameras located up to 1000 feet away, making it a clear channel for providing data. This digital OOH is still in a very nascent stage in India, the convergence of the physical and digital world is indeed exciting. The Advertising Week was coupled with the Google Partner Summit held on September 28th, 2017. The summit presented us with an array of interesting Google product updates to fuel the branding and advertising industry for the upcoming year, apart from the basic digital marketing trends to expect in 2017. Listed below are few of the key product updates that are guaranteed to create a huge positive impact on your firm’s digital marketing plans. AMP for Adwords landing pages: Gone are the days when AMP was available only for content-heavy sites. Google has noticed the importance of an ad to load faster for higher lead generation and introduced AMP for landing pages. While AMP has already been an important SEO factor, we have now started leveraging it even for paid advertising. In-market audiences for search: Google has introduced in-market audiences for the search engine so brands can now showcase their products to those who are actively searching for it. Brand Planner: Though still in the development stage, Google is planning to introduce Brand Planner – a tool similar to Google Trends – to track audience insights and to give brands more actionable insights. Location extensions for TrueView ads: Brands can now showcase their location in YouTube TrueView ads to increase traffic to their showrooms. YouTube Ad Sequencing: Brands can also sequence their ads on YouTube as per the viewing of the visitors. Consumer patterns and life events in Gmail ads: Gmail Ads can be customised based on consumer data like marriage, graduation and birth. YouTube Insights for search: Viewers can now watch ads that are customized based on the content consumed by them. Local inventory listed on Google: Brands can get their inventories listed on Google Maps for increased footfall. They can also retrieve the data of the number of people who have visited their stores through these listings from across 19 countries and get a better understanding of how mobile search can help offline retailers in India. Cross-device data for analytics: Brands can study consumer behaviour through data from advanced social media analytics retrieved from all digital devices – from a handy smartphone to a smart TV. After getting enlisted as a premier Google partner and attending the Google Partner Summit 2016 in San Francisco, Advertising Week 2017 was a much-anticipated event for us. It provided us with glorious insights and practices of the international digital marketing industry. It is time you start implying these practices in your marketing strategies to take your business to the next level. We know we are! It was a delightful day when we got the news of being invited for the Google Partner Summit and being upgraded to a Premier Google Partner. So when the time came, Rohit & I packed our bags and took the journey to cover 13,876 kms from Chennai to San Francisco. The journey was not just the distance, but the fact that at the Summit we were amongst 900 partners around the world, who together controlled about 8% of the global digital advertising spend. It was indeed a delightful experience to be part of it. "Now is our Moment" was an apt theme for the Google Partner Summit with multiple interactions with senior Google product managers and account managers interspersed with knowledge on how to manage talent as well as clients. It was a holistic agenda to help agencies like us succeed. Be there in the moment - Being there in the moment in the mobile first world is key and there was indeed a lot of discussion on the usual topics of mobile responsivness as well as website speed. There was discussion around the growing adaptation of Accelerated Mobile Pages (AMP) and infact Social Beat has already implemented AMP as well. With the responsive ads that Adwords has launched, the ads become a lot more immersive and adaptable to any device/ad unit size allowing brands to be there in the moment.The challenge with mobile has been that almost 75% of the audience start the interaction with the brand on one device, but complete it on another device. So measurement and tracking of ROI becomes a challenge. Fortunately, some tools like Optimizely help us resolve this. Measure across devices, channels, offline - Measurement being key, there was discussion around multi device, multi channel and offline measurement since many visitors who search online do visit the retail store. We do have an interesting article on how search can help offline and omni channel retailers in India. While store visits as a conversion metric is already live in Google Adwords, there are many more exciting developments that we can watch out for in the online to offline measurement. Leveraging Video for Brand Building & Sales - There is no doubt that video is the fastest growing medium in the digital space and many brands are creating engaging yet low cost videos for better brand recall and sales. Lucinda Barlow, Global Director of YouTube marketing pointed out that "There are only two things Americans do more than watch video: sleep & work" and that's the reason why digital video is going to be even bigger going forward. YouTube has lined up some interesting features for ecommerce and omni channel retailers so watch our blogs for more info on this. Virual Reality / AR - Part of the swag given by Google was the Cardboard which gave us a glimpse into the low cost Virtual Realty but what amazed us was the Google Day Dream (with Pixel) which is a very immersive VR experience and with devices becoming better and cheaper we are surely going to see more of them around. The experience brands can provide via VR is going to be a game changer and we look forward to exploring it. While Adwords is yet to integrate to VR/AR we do see that happening in the near future. Machine Learning - Machine learning not only refines the experience we get at Google but is also helping agencies like us with programmatic advertising, some of which we have started experimenting with our clients using Double Click. Its only going to get better, allowing brands and agencies to deliver relevance at scale. Apart from the product learnings, it was amazing for us to network and meet Google Partners from around the world and we even got to visit Googleplex and interact with product managers one on one (though we cannot share the details of these discussions yet). Earlier today, I spoke to a packed audience of retailers (omni channel and offline retailers) at the Chennai Retail Summit held by Retail Association of India (RAI) at ITC Grand Chola. I spoke on Winning the Connected Consumer, The Digital Way and you can see my slides below. Local SEO and digital marketing for retailers is very critical in this connected world. Its very important for them to leverage a mobile first strategy to capitalize on every micro moment. When we conducted our Indian Industry Digital Marketing Survey we found that many brands were facing challenges in measuring the return that their digital marketing and social media marketing efforts were giving. Hence, we included an eclectic panel discussion on “Measuring ROI of Digital Marketing” at our Digital Leadership Summit. We had four panelists moderated by Suneil from Social Beat: Mr. Vijay Anand - Sulekha.com, Mr. Arasu Shankar - Eshakti.com, Ms. Lavanya Hariharan – Zapluk and Mr. Shriram Sanjeevi - Oyethere.com. Instagram, Snapchat, Emailers are other ways to build ROI depending on the business. Suneil started off by asking the audience as to how many of them believed you could get ROI from digital marketing; it was a pleasant surprise to see that over 60% of the audience believed it could. We as a digital agency couldn’t agree more. The panel started with a discussion on what each of them feels about the results from digital marketing. We also have had a Digital Chai Pe Charcha on ROI of Digital Marketing, and you can read it here. Lavanya from Zapluk highlighted that they got a lot of organic growth once they started using the digital medium and in fact got 80% increase in customer base in just a month. As she rightly pointed out, it was a combination of brand building and lead generation activities. Vijay from Sulekha.com candidly shared that they were one of the highest spenders in the city on Google and that digital is critical to their survival. He shared that Sulekha gets around 250 million visitors via organic search and another 20-30 million via paid search in a year, and it’s their strongest channel for new user acquisition. Arasu from eShakti highlighted that the only channel they use is digital along with a bit of PR but not much offline marketing. They do get sales via SEO and referrals, but the growth of new customers is driven by digital advertising and marketing. They keep trying new features and functionalities on advertising channels like Facebook, allowing higher ROI. Over time, like Carat Lane they have built their digital score card on what matters to them - measuring and analytics are clearer now. Shriram from OyeThere.com said they use a 360-degree approach with a mix of digital and offline marketing based on his two decades of retail experience. He rightly pointed out that it’s a myth that digital gives immediate returns. Startups need to focus on building a brand, building the consumer trust and scaling up the service – then results come over time. Which digital channels are scaleable and to what extent? The entire panel did agree that the choice of the channel varies with the services/products and the consumer segment. It’s also very important to be smart as you scale adverting, as Arasu pointed out. It’s essential to be clear on what is the message you want to give about your brand. Vijay continued to be a strong propagator of Google Organic and Google Adwords and said it’s the most scalable as SEO efforts now start showing results in a few days, for existing/older sites. Since they focus on services with low engagement from end consumers they, tend to focus less on social media channels. They did spend 15 crores on their TVC campaign earlier this year it only gives 5000 incremental visitors a day which is minuscule for them as they get about 6-7 lakh visitors a day. Vijay added that for brand building to show results, you need to be at it all the time. On the other hand, Lavanya, Arasu & Shriram all spoke on how social media and in specific Facebook Marketing has worked extremely well for their businesses to get scaleable results. Lavanya highlighted that for a service wherein the consumer still doesn’t know it exists, the search volume on Google is extremely low hence Facebook & Twitter were the driving growth as they were able to achieve leads along with building the brand and engagement around it. Arasu & Lavanya also touched upon the importance of building the trust factor with consumers regarding answering their questions and doubts and also in terms of showcasing the products/service in a more holistic way. As Arasu rightly pointed out that Facebook allows for better product showcase via the carousel ads, videos, etc. Even brand awareness and the brand story is better executed via channels like Facebook and Instagram. Talking about the social trust that’s built out, Arasu added that they now see existing customers answering queries raised by potential clients and that it’s a game changer for them. Shriram added that the approach they take depends on the message, the channel also changes. For example, when they ran a huge campaign around Kabali by selling t-shirts, giving away movie tickets and more; Facebook worked very well for that as it’s a mass channel. We couldn’t agree more with Arasu when he said that "Channel will depend on product and customer segment." For example, if you are looking to target millennials then Snapchat would be an ideal platform. If your product or service is visual and you are targeting a sub 40-year-old audience, then Instagram would be an excellent channel but there is indeed a demographic difference across channels. eShakti also focusses a lot on Pinterest as it's relevant to many a fashion brand. Emailer Marketing still works if it’s with your own audience. Vijay of Sulekha spoke about how emailer marketing is an important channel and delivers results when done smartly with smart targeting, in spite of Gmail pushing a lot of emails to the Promotions tab. Of course, once a user is acquired it’s up to the brand to retain them and emailers is a great way to do that. Influencer Marketing was another channel that works very well and eShakti uses it extensively. Arasu shared that they work with 1000s of bloggers and they have built their network over a period. They calculate the ROI of influencers via direct referral traffic as well as transactions driven by the unique referral code given to each influencer. He also gave an interesting insight that there is higher trust from a consumer that comes via an influencer, so the 5-10% off that they give is covered up there. Everyone on the panel agreed that the return on marketing spend is not immediate; hence Life Time Value is an important metric to help scale up business and understand whether it’s moving towards profitability. The LTV depends on different businesses, and we got varied perspective from the panel. Arasu spoke about phenomenal ROI wherein it just takes them 1.2 transactions to recover marketing cost as they have high-value transactions and very high repeat purchase. For Zapluk and Pamperazi it was three transactions to get the back marketing cost. Whereas for a brand like Sulekha, the end consumer was not paying anything, so it’s difficult to ascertain LTV. Arasu mentioned that they look at the time taken to recover the marketing cost of acquiring the customer and for them, it’s usually the first 1-2 months whereas it is 3-4 months for Zapluk. Key metrics remain around customer acquisition, retention and finally on how to make them spend more and more often. It of courses varies by cohort, seasonality’s (for example, summer is a strong season for eshakti), types of customers, depends on the marketing channel and the marketing campaign that you run. Shriram again had a very different perspective and said that "The word LTV is over done. Companies that boasted of High LTvs have shut down in the last couple of months because LTV was more of a myth." He gave an example of Chennai’s leading retail chain Viveks wherein in many cases three generations have been shopping there and apparently they are also grappling with LTV. He also questioned how come Flipkart only had 32% growth in spite of the perceivable high LTV. One of the participants had a very relevant question - Sejal from Zoho asked what are the tools use for calculating ROI. In most cases, Google Analytics along with data from Google Adwords, FB Ads, Instagram Analytics and other social media analytics tools would suffice. Suneil added that Improvely could be a great tool to understand muti-touch attribution as consumers often interact with the brand multiple times before the sale is closed. This tool allows you to see the history of the person and how they interacted with your brand. Read more about Improvely and other similar analytics tools here. Suneil also added that there is sometimes a time lag between generating a lead to sale and ROI can be improved if you can figure out how to leverage that time frame to communicate about the brand and the offerings. Vijay spoke about Google Analytics Premium (GAP) which is more relevant for larger organisations as its costs around USD 90,000 a year. He talked about Google Analytics data being heavily sampled; wherein GAP has unsampled data which can also be downloaded. GAP has only around 15 clients in India but Vijay recommends it’s to e-commerce and digital businesses as repeat customers are harder to track in free analytics tools and attribution is not always clear. 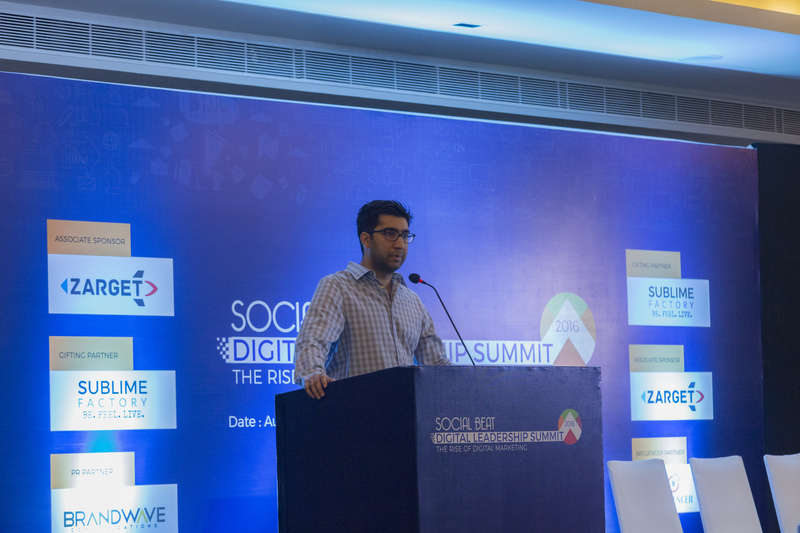 Below is the gist of the talk given by Mithun Sacheti on “How Digital drove the success of Carat Lane” at the Digital Leadership Summit in Chennai in August 2016. Omni-channel is the approach towards profitability and Carat Lane has seen that with their Delhi centre, which contributes to 38% revenue and is a profitable city for them. Mithun started off by highlighting that Chennai as the choice for Carat Lane did not come from the fact that he was based here but based on research that Chennai has the fastest clearing airport in the country. He goes on to talk about how opening the first Jaipur Gems store was challenging. Their biggest learning over the initial years was getting a clear understanding of the top/key customers since they used to get only about three walk-ins a day when they started out. They soon realized that making customers discover the store and new products is key. So when they opened their next store in Coimbatore, they were able to combine their learnings to ensure that 500 key customers walked into the store just on day 1. How did they get into e-commerce? They realised that discovery of products is a problem because of the limited walk-ins in retail as well as the limited scope to discover products before walking into the store. E-Commerce fundamentally changes the discovery process. Today consumers make a choice before entering the retail store – the decision is usually made online. This is why global e-commerce started with books so that the discovery & shopping can happen online. For other products discovery is still lead by digital, but consumption is happening across e-commerce, offline retail, kiosks, etc. In 2011, Carat Lane opened its first retail store – but they got it wrong in many ways. Firstly, they did not put much jewellery over there, though in hindsight they understood that consumers come in to try out the product. In Mithun’s words “We assumed customers were as obsessed with technology, as we were”. This changed when they opened their future stores. Moreover, their Perfect Look app allows you try out jewellery real time, and this was a big hit amongst consumers. Why do consumers have distrust amongst e-commerce companies? Mithun highlights on e-commerce evolution in India and candidly pointed out that between 2000 to 2009 there were early adopters who did not focus on last mile delivery and consumer experience - players like Indiatimes, Rediff, infibeam. This mostly led to distrust from consumers because they went through such bad experiences from these brands. This, of course, changed when the new age e-commerce companies started, including Carat Lane in 2008. Is ROI real in E-Commerce? In 2012 when the company evaluated its results, it realized that cost of acquisition was so high; it would take three transactions to make the customer profitable but an Indian consumer shop for jewellery twice a year so there was something wrong in the approach. Their retail stores were a game changer because the process of discovery started falling in place. Consumers now started coming to the store with the product photograph wanting to try the product. It became evident that conversions will happen where they have an omnichannel presence. Two years ago they opened six stores in Delhi and now 38% of their revenue comes from Delhi and is the only profitable city of operation at the moment. Is it an analytics business or a jewellery business? Mithun aptly put it “There is never too little data”. Data helps bring clarity, and while it took Carat Lane 6 years to figure it out, it finally made sense. In the early days, the cost of consumer acquisition was never in focus. You need to know how much you are willing to pay for each of the above actions, as the business profitability depends on that. Each company needs to create its own attribution model - based on customer type. Google Analytics is a good starting point. Speaking on how they used the funding they got, Mithun admits “Money is like oxygen, the human body is like iron - money can corrupt you”. They have learnt it the hard way and now moving towards profitability with a data-driven approach. On closing. Mithun said that Digital would own discovery and budgets will move digital - which was also reflected in the Social Beat Industry Report. We, of course, agree when he said that India would be driving the digital transformation and even today with the worst internet bandwidth ever we have achieved this much – it's only up to our imagination what the future holds! Content Marketing is less about marketing and more about content. Brand are allocating as much as 15% of their total marketing budget towards content marketing. 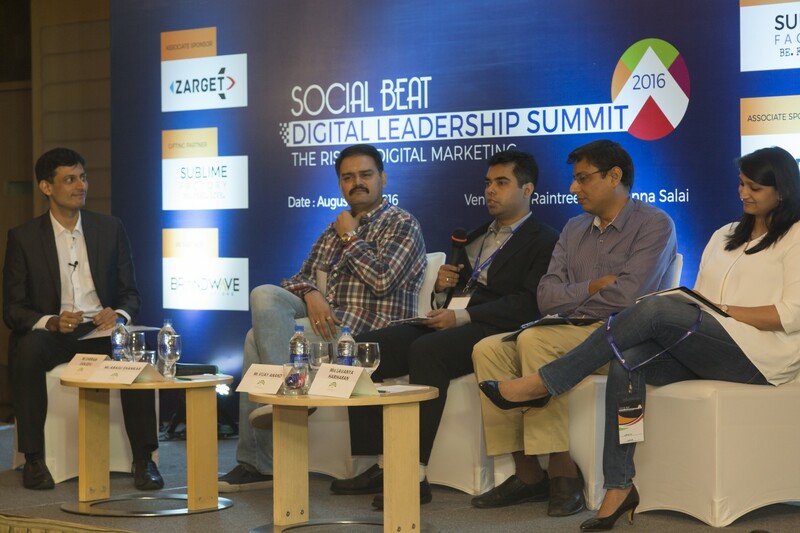 Chennai, 5th Aug 2016: The 1st Social Beat Digital Leadership Summit 2016 was a congregation of over 125 CMOs, Brand Heads & CXOs from varied industries. Mithun Sacheti, the Keynote Speaker kick started the Summit and shared insights on how a data driven approach at Carat Lane has helped it acquire customers and build a brand. Carat Lane's internal team analyses over 4000 data points, from across channels, including TV, Retail, Print, Radio and Online Marketing. The keynote session was followed by a panel discussion on Measuring ROI from digital marketing. Moderating the panel, Suneil Chawla, Co-Founder of Social Beat, said “Depending on whether the business has a product which has high search volume or is an impulse purchase, Google or social media will be more effective.” Arasu Shankar from eShakti.com said “Apart from tracking the cost of acquiring a customer, it is important to understand the lifetime value of the customer in order to be able to understand the profitability of the business”. The last discussion was around How Content Marketing can work for your brand with two successful brands, Matrimony and Murugappa Group sharing their experiences. Vijaylakshmi D, Senior Associate Vice President at Murugappa Group speaking on their successful content strategy around Madras Song said “Murugappa Group always had a strong connect with the city of Madras and we have had ongoing activities around this. When we looked at how do we connect with today’s generation we decided to use music and video as the medium to create the Madras Song to engage people to share their live for Madras.”. Murugappa Group in fact allocates close to 15% of marketing budget towards content marketing. 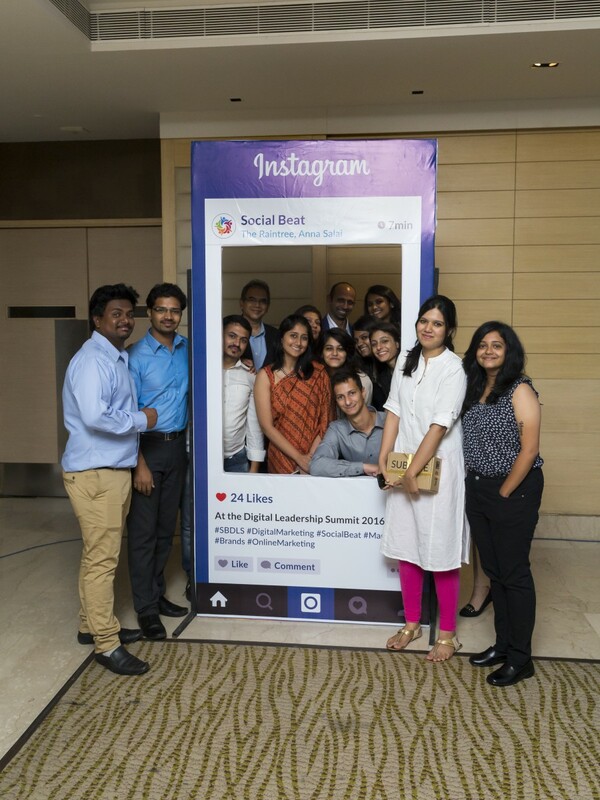 Thanks to the entire organising team at Social Beat for pulling off the Summit - Kudos to them! And a big thank you to our partners - Zarget, Sublime Factory & Brandwave.